Cornerstone are an Austrian band who were formed in 1998. In 2008 they released their album "Head over heels" through Atom records, and after touring for that album, recruited their new singer Patricia Hillinger. Now the band are ready to release "Somwehere in America" and it's an album worth the wait. The Press release with the album describes the band as "Modern AOR pop rock". I'm not sure I'd agree with that description really though - when I think of pop I tend to think of mindless lyrics and a total absence of guitars, and this is far too good to be classed as pop. The AOR description is more accurate and the Rock description is definitely accurate. I'd describe the music as melodic rock or soft rock, in a similar vein to bands such as Heart. Whatever pigeonhole you choose to put the band's music into, the simple fact is that this is damn good stuff. 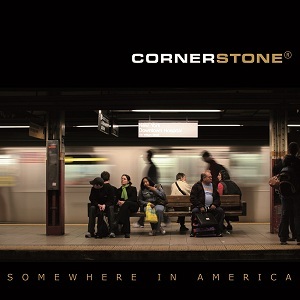 One of the best parts of reviewing albums is when you come across a band you haven't heard of before so have no real expectations and are then really impressed when you listen to it for the first time - Cornerstone fall into this category with "Somewhere in America"
Patricia Hillinger has a great voice - with great quality and plenty of power when she needs it, and her voice is a highlight of the album. "Right or wrong" is my favourite track on the album, a beautiful ballad built mainly around the keyboards and Patricia Hillingers beautiful voice which is really allowed to shine. A great album from a band I'll definitely try and see live when they next visit the UK. Somewhere in America is due to be released through Atom records on the 30th September 2011.